It has often been said that Catgut and Steel (named for the strings on their instruments) have a sound bigger and fuller than two musicians would normally command - yet they play all their own instruments and use no backing tracks of any kind. 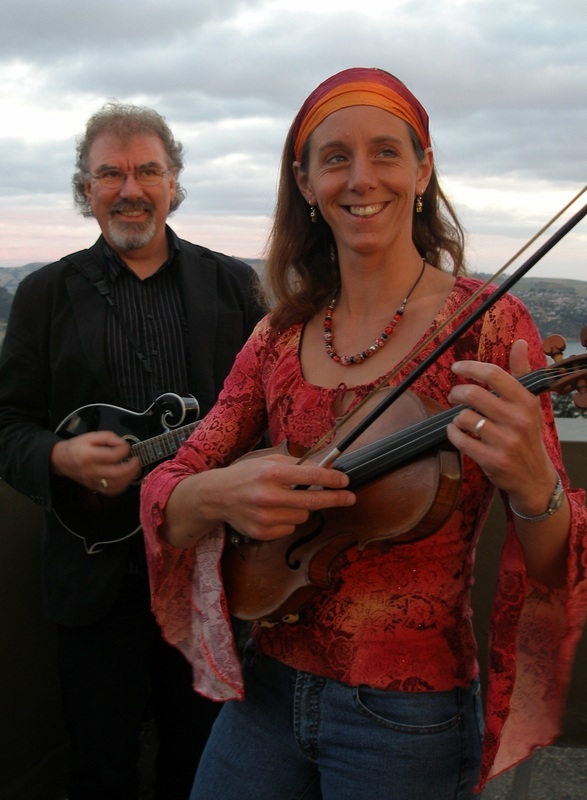 Their repertoire is amazingly eclectic from Celtic tunes to contemporary covers, klezmer to country, but always with the strong vocal harmonies and swinging rhythm styles for which they are renowned. Catgut and Steel are sometimes a duo of 5 or more people! 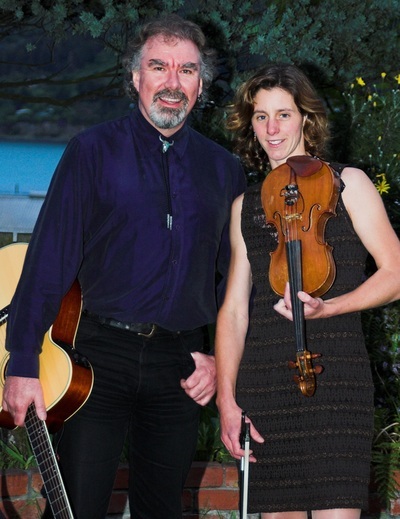 Always exciting and unpredictable, Mike and Anna are renowned for their abilty to form large bands out of thin air. With over 50 years of playing experience between them (and it's probably only fair to point out that most of those belong to the old fella) Mike and Anna come from diverse musical and geographical backgrounds. Anna was a stundent of classical violin in Holland where she lived until she emigrated to Australia and eventually, to New Zealand. Mike has always lived on the same hill in his hometown Dunedin and after the usual childhood piano lessons, discovered the guitar in his early teens, playing in rock bands (which he still does) and has been involved in the New Zealand folk scene since the early eighties. Mike and Anna teamed up through their involvement in the now defunct Pioneer Pog 'n' Scroggin Bush Band. Mike also plays in the internationally renowned acoustic showband, The Chaps. 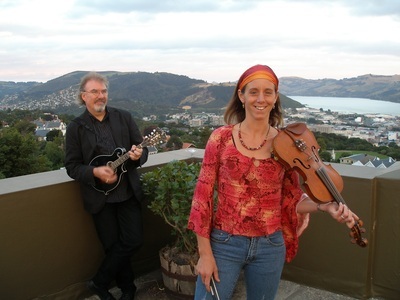 Anna is a well known figure busking around Dunedin, with her distinctive fiddle style and her fiddling companion Coco the Cat. Material covered by the both the duo and the band includes songs by the Pogues, Van Morrison, Sting, Dave Dobbyn, Crowded House, Bic Runga, Christy Moore, Jeff Buckley, Richard Thompson, Alison Kraus as well as many Irish, Scottish, European and American tune sets. 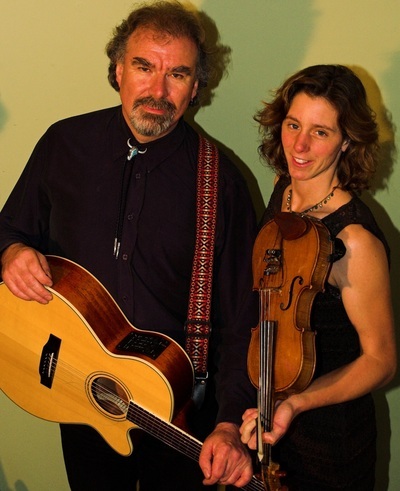 Catgut and Steel can provide an evening of Irish music, country music, dance music - whatever your theme demands. They can play "plugged" or "unplugged" depending on the nature of your event. Commissioned works are also possible. 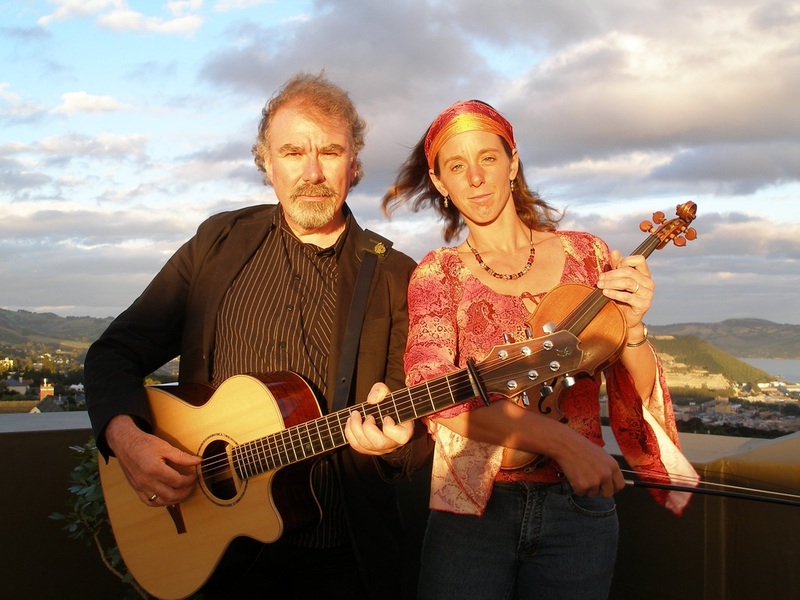 In concerts and folk festivals, Mike and Anna are a warm, humourous and engaging act with a wide range of material, some original, some well known and some more obscure ballads and tunes - often giving the folk treatment to a well known pop or country song. Here are just some of the more well-known things we play. We have an extremely wide repertoire that is very entertaining, including lively jigs and reels and other well known instrumentals, old swing and jazz numbers as well as popular Irish, Scottish and C&W material – all rendered with acoustic guitar and fiddle or mandolin. Why don't we play anything particularly recent? It ain't stood the test of time.